The primary consideration for lenders when evaluating a new insurance agency loan is risk. If you are considering a loan for your insurance agency, it is important to understand how most lenders perceive risk. Often, lenders discern risk slightly differently than borrowers, but it is important to understand that both bring unique and valuable perspective to the evaluation process. When evaluating risk, most lenders place an emphasis on five components. Financial commitment is defined by the amount of your own savings you are willing to contribute to a transaction. This is most important on a new business acquisition where a down payment may be considered. Lenders will consider an acquisition where an applicant is willing to contribute a considerable portion of their savings to be lower risk than one where an applicant is not willing to contribute any of their savings. For many lenders, credit history can be summed up simply with a FICO score. If a lender has a minimum credit score requirement it may be the first and only piece of due diligence they complete. If the FICO score does not meet the lender’s minimum requirement, the loan will be declined without further evaluation. 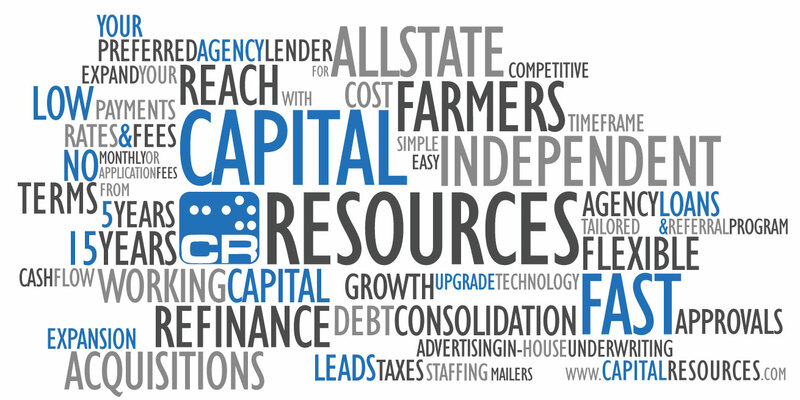 For Capital Resources, FICO scores are just one component of credit history. Capital Resources considers the circumstances that may have affected the FICO score and listens to the applicant to help understand if the score is an accurate depiction of the individual it is tied to. If the credit report delinquency is not chronic, can reasonably be explained or if factors that affect the score are not clear indicators of risk, Capital Resources will take this into consideration. If a loan applicant has a credit history that indicates creditors losing their investment on them then the perceived risk goes up. Similarly, if the credit history evidences a consistent pattern of payment delinquencies, then this elevates the lender’s perception of the risk. Since the primary source of collateral for an agency loan is the cash flow (revenue) from commissions within an insurance agency book of business, a lender will consider the durability of its revenues. Because collateral value is directly correlated to an agency’s annual commission revenues then historical trends must be considered to estimate future collateral value. Increasing trends indicate better risk and more durable collateral. If an agency has consistently experienced a decline in annual revenues year after year then the collateral has proven to not be durable. In other words, agencies with poor performance history will be deemed higher risk than those with neutral or good performance history. The professional experience of the applicant is one of the most important considerations for lenders when evaluating risk. Different types of agencies require different types of experience. Agencies that focus on commercial lines written through a network of MGAs require a much different skill set than a captive retail P&C agency. An applicant whose professional experience is not in line with the type of agency being proposed as collateral will elevate the lenders perceived risk of the transaction. Loans with traditional uses of proceeds will be viewed as lower risk than those with non-traditional uses of proceeds. If you are considering an insurance agency loan, it will help to consider the risk from the lender’s perspective. This will prepare you for questions that will be asked during the underwriting process. The more prepared you are to address the lender’s concerns, the higher the likelihood of you securing the financing you desire. Evaluating the risk from a different perspective may also help you confirm whether your opportunity is one worthy of your own pursuit. Would you like to be contacted for a RISK FREE consultation? If so, please click the button below. Or call us today at 1-866-523-6641. Getting a Loan for Your Insurance Agency Shouldn’t be a Complicated Mess.